Pulsar Microwave Corporation, established in 1987, is a valued supplier of high quality RF and microwave passive components in the frequency range of DC to 85 GHz. Custom specifications are available at little to no extra cost, when based on a standard catalog item. Our wide band 8-way PS8-53-454/4S covers the frequency range of 10-40 GHz with 2.5 dB of insertion loss and 12 dB isolation. Amplitude balance is +/- 0.8 dB and phase balance is 12 degrees. VSWR is 1.9:1, Power handling is 10 watts, and the outline dimensions are 4.0 X 2.0 X 0.40 inches with 2.92mm female connectors. or contact sales@pulsarmicrowave.com for additional information and pricing. 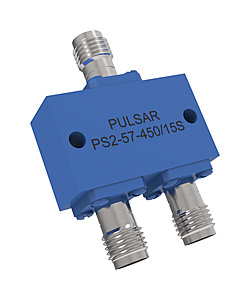 A new addition to Pulsar’s coupler line, CS10-56-436/20 covers the frequency range of 0.5-27.0 GHz with 10 +/- 1 dB coupling, 1.5 dB insertion loss, a frequency sensitivity of +/- 1 dB, and 12 dB directivity. Power handling is 20 watts and VSWR is 1.70:1. Connectors are 2.92mm female. 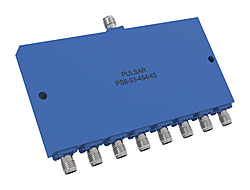 Pulsar has added a new 2-way power divider, model PS2-57-450/15S, covering a frequency range of 10-70 GHz with 2.0 dB of insertion loss and 12 dB isolation. Amplitude balance is +/- 1.0 dB and phase balance is 10 degrees. Outline dimensions are 1.0 X 0.8 X 0.38 inches with 1.85mm female connectors. 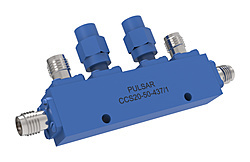 Pulsar adds model CCS20-50-437/1B with a frequency range of 6-26.5 GHz to its broadband dual directional coupler line. Coupling is 20 +/- 1 dB, with +/- 0.8 dB frequency sensitivity, and loss is 0.9 dB. The VSWR is 1.6:1 and directivity is 12 dB. The unit can accept an input power level of 20 watts. Outline dimensions are 2.1 x 0.55 x 0.38 inches and connectors are 2.92 mm female.